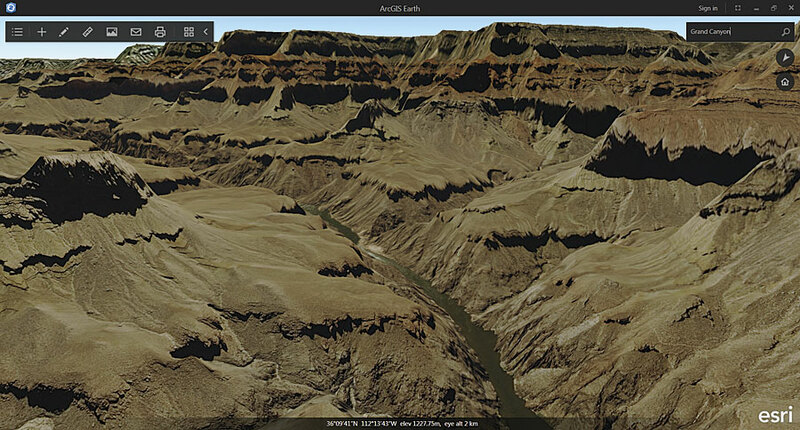 3D terrain views, like this one of the Grand Canyon, are available by default in ArcGIS Earth. ArcGIS Earth, an interactive globe that allows users to explore any part of the world and work with 3D and 2D data, is now available from Esri. Fully integrated with the ArcGIS platform, the program works with Esri and open standard data formats, including shapefiles and KMLs. Users who want to quickly view spatial information can use ArcGIS Earth, at no cost, to access map data that has been shared with them as a file or link. They can also work with data stored behind a firewall in ArcGIS for Server or ArcGIS Online, as well as securely access, share, and publish their enterprise maps and data. The ArcGIS platform’s 3D capabilities span a number of products that are built to meet diverse needs. At one end of the spectrum, the 3D Scene Viewer allows anyone with a web browser to easily view, create, and share location information in 3D. At the other end, ArcGIS Pro enables users to do advanced 2D and 3D visualization, editing, analysis, and publishing. ArcGIS Earth extends these 3D capacities. This 3D view of buildings in San Francisco, which is a web service, makes it easier to see details that might not be prominent on a 2D map. Go around the world. Start with a view of the globe and zoom in to the rooftop of a house. Or, explore different terrains, oceans, and mountains anywhere in the world. Tilt and rotate the high-performance, interactive globe to unearth new details about a multitude of locations using 3D views and satellite imagery. The user interface is immersive. Take in the full picture. Instantly open familiar data formats—such as KML files, KMZ files, shapefiles, imagery, and web services—to view them in 3D and see details that might not be prominent in 2D. Continue with already established workflows and access publicly shared feature, scene, map, and image services via a URL or by browsing services in Portal for ArcGIS or ArcGIS Online. Users who log in with named user accounts can access secure organizational and group data. ArcGIS Earth allows users to instantly open familiar data formats, such as this KML file of air quality data, and view them in 3D on the globe. Add context to maps. Incorporate publicly shared basemaps from ArcGIS Online, including global imagery, topographic maps, world ocean maps, and OpenStreetMap. ArcGIS Earth supports content from the Living Atlas of the World as well, including demographic, landscape, terrain, and transportation data. Sketch and measure. ArcGIS Earth supports basic linear and segmented distance measurements. So interpret elevation; calculate distance and area; and draw point, line, or polygon place marks. Communicate progress more effectively. Report the status of a project and present work to stakeholders or clients in a compelling and interactive 3D format. Supplement maps with sketches and annotations to help others see the situation comprehensively. With one click, ArcGIS Earth users can email a 3D map view to others or save it as an image to share later. Enable secure access. Like the rest of the platform, ArcGIS Earth allows users to share data securely through enterprise IT compliance and private groups and services. Outside an enterprise firewall, access information in ArcGIS Online, including basemaps, terrain, and data shared publicly by other users. Inside the firewall, create basemaps and services using Portal in ArcGIS for Server. 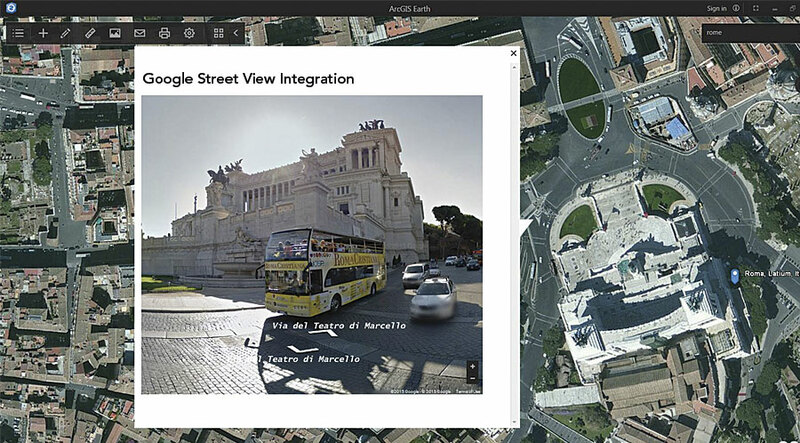 With a Google Apps API key, Google Street View can be integrated inside ArcGIS Earth to give users an on-the-ground look at places such as the National Museum of Italian Emigration in Rome, Italy. ArcGIS Earth is part of Esri’s offer for Google customers and partners looking to transition to Esri software. 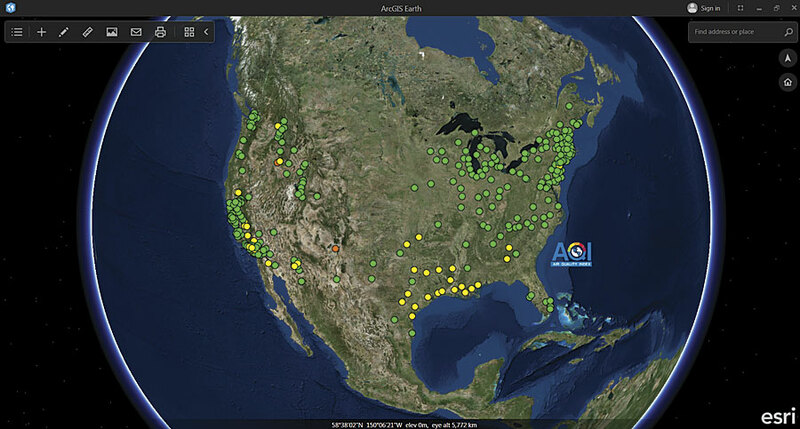 Along with the other capabilities of the ArcGIS platform, ArcGIS Earth provides an alternative to the Google Earth Enterprise Client. Additionally, those with a Google Apps API key can implement Google Street View inside ArcGIS Earth. Using a web service, they can call Google Street Views in KML, point ArcGIS Earth to the service, and display Google Street Views in ArcGIS Earth. Now that ArcGIS Earth has been released, Esri is focusing on adding new features and enhancements. Support for web map services, time sliders, map tours, and offline use are on the road map and will be released in future versions. ArcGIS Earth is free, so anyone can install it and begin using it—without impacting the budget. 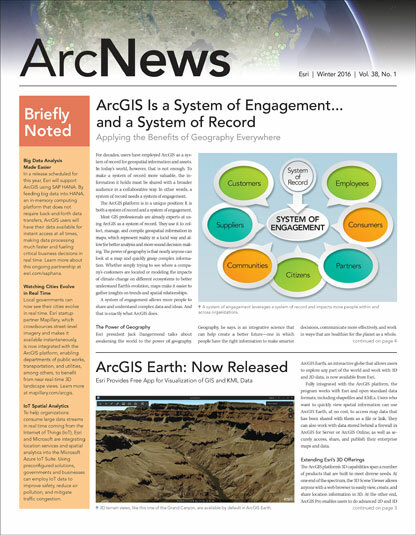 Download ArcGIS Earth.